Do you live in an area with bats? We do, but they’re so fast that they’re very hard to spot when they’re scudding about after insects at dusk; and, of course, human ears are not equipped to hear the ultrasonic tones that they use to make their echolocation calls, so we can’t hear them either. A bat primer. Bats are not, as folk legend has it, blind: they can see as well as you or I can. 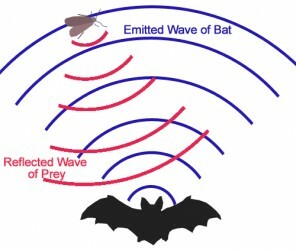 But like you or I, they can’t see in the dark, so they use a rather brilliant system of echolocation to “see” where buildings and the insects they predate on are at night. They make a series of extremely high-frequency calls, and use their big ears to judge how far objects are from them by the amount of time it takes those calls to bounce back to them, which allows them to locate prey and avoid obstacles with great accuracy. Your human hearing, depending on how old you are (we lose the top frequencies as we age) will range from about 20Hz (cycles per second) to 15-20 kHz (1000Hz). The sounds bats can hear and produce go all the way up to about 110 kHz. Their calls (which are pretty loud, so perhaps it’s a good thing we can’t hear them) aren’t just one tone: depending on breed, they sweep down from a high frequency to a low one; or move the tone around and around a specific frequency. Over in Germany, Holger and Henrike Körber have turned a Raspberry Pi into a bat detection device. 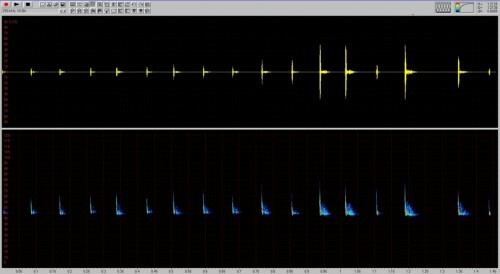 An inexpensive high-sensitivity microphone capable of detecting high frequencies, and some batty software, mean users can make graphical interpretations of bat calls; create histories of bat activity; manipulate those calls to bring them into frequencies they can hear; and identify bat species by call using an algorithmic process. The Körbers also make available a list of bat literature, so you can deep-dive into echolocation and acoustic identification of bat species. Head over to http://www.bat-pi.eu/ to find out what you need and how to get started. If you don’t speak German, you’ll need to run the page through Google Translate; it’s worth doing. Update, Aug 12 2015: Henrike mailed me to let me know about an English-language newsletter about the project. We think you’ll find it a really interesting and informative read. You can download it here. Update, Nov 4 2016: Bat Pi 2 is here! Read more on the Bat Pi website. What a brilliant idea! We need to try this with our bats: there are enough of the little fellows living in our roof, after all. Actually “Fledermaus Schutz” means bat conservation. Even though this is for pi-oriented articles, one can build a bat detector using a quad-opamp IC and a handful of other components. See Nuts and Volts, June 2011 for one such construction project. That will give you a heterodyne detector – it blends two high frequencies (one generated,one environmental) and you hear the interference beats between them. Very cheap and good for detecting bats but not very good for identifying them. This would be a great project for rural schools! Interesting and definitely something I’ll consider but I’m not sure if €290 qualifies as “an inexpensive high-sensitivity microphone”! Although, I’d guess in the world of high sensitivity microphones this probably qualifies as inexpensive? Been interested in bats for some time, so I got me one of these about 8 years ago, just short of £39.00 http://www.magenta2000.co.uk/acatalog/Bat_Detector_Mk_2.html worth it for the microphone alone. It is the hytrodining type. At 200 Euros I wouldn’t call the microphone inexpensive. OMG – My mum would love this! Running any German website through google translate is worth doing. All very well, but how is it at detecting people singing operas with music by Johann Strauss, Jr.? that rtc module is it on the picture? is it powered by a cap – isn’t it? yes, the real time clock module is the small square blue board attached to the GPIO header. The larger round object is the battery (probably a super capacitor). but note that RTC’s for the PI are a dime a dozen, and this one is probably already obsolete. @mahjongg: thank you for searching, finding and sharing the video link with that device i was looking for. There’s a CR1620 battery on that RTC board so it doesn’t lose time when the RPi is powered dowm. quick Robin – to the Batmobile !! Although certain bat species “shout” at frequencies above 100kHz, it is worth researching what species you are likely to encounter in your local patch. Of the 18 or so species identified in the UK, probably only 4 will ever make an appearance in my part of Sussex. These all “shout” in the range 45-55kHz. So I can get away with a small, cheap electret microphone, which often have a useful response up to about 60kHz. Thanks Steve; that’s really helpful! You will see that this is quite successful in recording a variety of species. You might be as surprised as I was in how many different types are flying around your patch! In Germany you can get, for around 20€, a basic bat detector DIY kit (soldering required) that works reasonably well. I understand it uses an IC usually found in cheap AM radios, you tune in to a frequency and it then converts ultrasound near that frequency to a human audible sound played thru a speaker, so it’s far less versatile than a digital, “broad band” device like this Pi project, but I wonder if you could perhaps reuse the microphone from this kit for experiments. Or feed an (unamplified) speaker output to a USB sound card input ?? Anyway that would be a really low cost alternative. a new image for model A+,B+ and Pi 2 Model B will be hopefully ready for download next week. There will be new features like handling with WLAN,SMS sending; GPS reference. The “unexpensive” (concerning bat detector standards) Dodotronic Ultramic 250k was selected as a realtime detector, which produces high quality recordings, that can be analysed to species specific level. This garantees, that the bat calls can be sent to any other bat worker and can be analysed world wide. 250k/ 16 bit as sampling frequency is sufficient to catch bat callings from x kHz up to 125 kHz (depending on the frequency border settings of the BatPi) in a good quality. 120 kHz down to about 12 kHz, so the system is fitting even for research purposes, but also interested laymen can handle it. Please keep in mind that you can use each element ofthe modular system for other purposes. For example the Dodotronic Ultramic250K can be run with a windows tablet/Notebook (Only works with windows 7 ! ), Ipad or Iphone. existing system and we can react on innovation of raspberry pi models, detectormicrophones etc., without putting the whole modules into the waste. You are invited to find your own add-on and join our bat community. 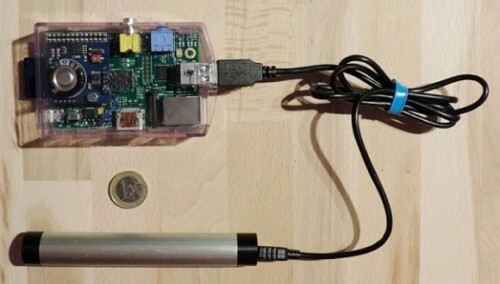 I’ve been using a dodotronic mic with a mac and am keen to get going with it on the Pi. I’ve downloaded the image but I can’t seem to find the login details anywhere. The usual pi/raspberry default doesn’t work (even though I spotted it uses a german keyboard mapping). Any clues? please send technical questions directly to our Emailadress ! There's a question we've been asked very frequently about the camera board.